In addition to traditional Proof of Work (PoW) rewards for mining Axe, users are also rewarded for running and maintaining special servers called masternodes. Thanks to this innovative two tier network, Axe can offer innovative features in a trustless and decentralized way. Masternodes are used to power PrivateSend, InstantSend, and the governance and treasury system. Users are rewarded for running masternodes; 45% of the block reward is allocated to pay the masternode network. You can view practical guides on all topics relating to masternodes here. InstantSend allows for near-instant transactions. Axe InstantSend transactions are fully confirmed within two seconds. Governance and Treasury allows stakeholders in Axe to determine the direction of the project and devotes 10% of the block reward to development of the project and ecosystem (as of May 2018, our annual budget exceeds $30 million). Axe Evolution will make using cryptocurrency as easy as using PayPal. Masternode owners must have possession of 1000 AXE, which they prove by signing a message and broadcasting to the network. Those coins can be moved at any time, but moving them will cause the masternode to fall out of queue and stop earning rewards. Masternode users are also given voting rights on proposals. Each masternode has one vote and this vote can be used on budget proposals or important decisions that affect Axe. Masternodes cost money and effort to host so they are paid a percentage of the block reward as an incentivize. With current masternode numbers and rewards, masternodes earn approximately a 8% return on 1000 Axe (which means 6.97 Axe or USD1360 in July 2017) for the year of 2017. This tool shows a live calculation of masternode earnings. These rewards decrease by 7% each year, but the rising value of Axe may offset these reductions. As a matter of fact, masternodes were receiving 140 Axe per month at the beginning of 2016, but this was actually less money than today: USD600 per month. There is also the possibility for masternodes to earn money from fees in the future. PrivateSend gives you true financial privacy by obscuring the origins of your funds. All the Axe in your wallet is comprised of different “inputs”, which you can think of as separate, discrete coins. PrivateSend uses an innovative process to mix your inputs with the inputs of two other people, without having your coins ever leave your wallet. You retain control of your money at all times. You can view a practical guide to use PrivateSend here. PrivateSend begins by breaking your transaction inputs down into standard denominations. These denominations are 0.001, 0.01, 0.1, 1 and 10 AXE – much like the paper money you use every day. Your wallet then sends requests to specially configured software nodes on the network, called “masternodes”. These masternodes are informed then that you are interested in mixing a certain denomination. No identifiable information is sent to the masternodes, so they never know “who” you are. When two other people send similar messages, indicating that they wish to mix the same denomination, a mixing session begins. The masternode mixes up the inputs and instructs all three users’ wallets to pay the now-transformed input back to themselves. Your wallet pays that denomination directly to itself, but in a different address (called a change address). In order to fully obscure your funds, your wallet must repeat this process a number of times with each denomination. Each time the process is completed, it’s called a “round”. Each round of PrivateSend makes it exponentially more difficult to determine where your funds originated. The user may choose between 1-16 rounds of mixing. This mixing process happens in the background without any intervention on your part. When you wish to make a transaction, your funds will already be anonymized. No additional waiting is required. Note that PrivateSend transactions will be rounded up so that all transaction inputs are spent. Any excess Axe will be spent on the transaction fee. IMPORTANT: Your wallet only contains 1000 of these “change addresses”. Every time a mixing event happens, one of your addresses is used up. Once enough of them are used, your wallet must create more addresses. It can only do this, however, if you have automatic backups enabled. Consequently, users who have backups disabled will also have PrivateSend disabled. Traditional decentralized cryptocurrencies must wait for certain period of time for enough blocks to pass to ensure that a transaction is both irreversible and not an attempt to double-spend money which has already been spent elsewhere. This process is time-consuming, and may take anywhere from 15 minutes to one hour for the widely accepted number of six blocks to accumulate. Other cryptocurrencies achieve faster transaction confirmation time by centralizing authority on the network to various degrees. Axe suffers from neither of these limitations thanks to its second-layer network of masternodes. Masternodes can be called upon to form voting quorums to check whether or not a submitted transaction is valid. If it is valid, the masternodes “lock” the inputs for the transaction and broadcast this information to the network, effectively promising that the transaction will be included in subsequently mined blocks and not allowing any other spending of these inputs during the confirmation time period. InstantSend technology will allow for cryptocurrencies such as Axe to compete with nearly instantaneous transaction systems such as credit cards for point-of-sale situations while not relying on a centralized authority. Widespread vendor acceptance of Axe and InstantSend could revolutionize cryptocurrency by shortening the delay in confirmation of transactions from as long as an hour (with Bitcoin) to as little as a few seconds. You can view a practical guide to use InstantSend here. InstantSend was introduced in a whitepaper called Transaction Locking and Masternode Consensus: A Mechanism for Mitigating Double Spending Attacks. In response to unforeseen issues with the rollout of the major “RC3” update in June 2014, the Axe development team created a mechanism by which updated code is released to the network, but not immediately made active (“enforced”). This innovation allows for far smoother transitions than in the traditional hard fork paradigm, as well as the collection of test data in the live network environment. This process of multi-phased forking was originally to be called “soft forking” but the community affectionately dubbed it “the spork” and the name stuck. New features or versions of Axe undergo extensive testing on testnet before they are released to the main network. When a new feature or version of Axe is released on mainnet, communication is sent out to users informing them of the change and the need for them to update their clients. Those who update their clients run the new code, but it is not activated until a sufficient percentage of network participants (usually 80%) reach consensus on running it. In the event of errors occurring with the new code, the client’s blocks are not rejected by the network and unintended forks are avoided. Data about the error can then be collected and forwarded to the development team. Once the development team is satisfied with the new code’s stability in the mainnet environment – and once acceptable network consensus is attained – enforcement of the updated code can be activated remotely by multiple members of the core development team signing a network message together with their respective private keys. Should problems arise, the code can be deactivated in the same manner, without the need for a network-wide rollback or client update. For technical details on individual sporks, see here. X11 is a widely used hashing algorithm created by Axe core developer Evan Duffield. X11’s chained hashing algorithm utilizes a sequence of eleven scientific hashing algorithms for the proof-of-work. This is so that the processing distribution is fair and coins will be distributed in much the same way Bitcoin’s were originally. X11 was intended to make ASICs much more difficult to create, thus giving the currency plenty of time to develop before mining centralization became a threat. This approach was largely successful; as of early 2016, ASICs for X11 now exist and comprise a significant portion of the network hashrate, but have not resulted in the level of centralization present in Bitcoin. Information on mining with X11 can be found in the Mining section of this documentation. X11 is the name of the chained proof-of-work (PoW) algorithm that was introduced in Axe (launched January 2014 as “Xcoin”). It was partially inspired by the chained-hashing approach of Quark, adding further “depth” and complexity by increasing the number of hashes, yet it differs from Quark in that the rounds of hashes are determined a priori instead of having some hashes being randomly picked. The X11 algorithm uses multiple rounds of 11 different hashes (blake, bmw, groestl, jh, keccak, skein, luffa, cubehash, shavite, simd, echo), thus making it one of the safest and more sophisticated cryptographic hashes in use by modern cryptocurrencies. The name X11 is not related to the open source X11 windowing system common on UNIX-like operating systems. The increased complexity and sophistication of the chained algorithm provides enhanced levels of security and less uncertainty for a digital currency, compared to single-hash PoW solutions that are not protected against security risks like SPOF (Single Point Of Failure). For example, a possible but not probable computing breakthrough that “breaks” the SHA256 hash could jeopardize the entire Bitcoin network until the network shifts through a hard fork to another cryptographic hash. In the event of a similar computing breakthrough, a digital currency using the X11 PoW would continue to function securely unless all 11 hashes were broken simultaneously. Even if some of the 11 hashes were to prove unreliable, there would be adequate warning for a currency using X11 to take measures and replace the problematic hashes with other more reliable hashing algorithms. Given the speculative nature of digital currencies and their inherent uncertainties as a new field, the X11 algorithm can provide increased confidence for its users and potential investors that single-hash approaches cannot. Chained hashing solutions, like X11, provide increased safety and longevity for store of wealth purposes, investment diversification and hedging against risks associated with single-hash currencies plagued by SPOF (Single Point Of Failure). Evan Duffield, the creator of Axe and X11 chained-hash, has written on several occasions that X11 was integrated into Axe not with the intention to prevent ASIC manufacturers from creating ASICs for X11 in the future, but rather to provide a similar migratory path that Bitcoin had (CPUs, GPUs, ASICs). DGW or Dark Gravity Wave is an open source difficulty-adjusting algorithm for Bitcoin-based cryptocurrencies that was first used in Axe and has since appeared in other digital currencies. DGW was authored by Evan Duffield, the developer and creator of Axe, as a response to a time-warp exploit found in Kimoto’s Gravity Well. In concept, DGW is similar to the Kimoto Gravity Well, adjusting the difficulty levels every block (instead of every 2016 blocks like Bitcoin) based on statistical data from recently found blocks. This makes it possible to issue blocks with relatively consistent times, even if the hashing power experiences high fluctuations, without suffering from the time-warp exploit. Version 2.0 of DGW was implemented in Axe from block 45,000 onwards in order to completely alleviate the time-warp exploit. Version 3.0 was implemented on May 14 of 2014 to further improve difficulty re-targeting with smoother transitions. It also fixes issues with various architectures that had different levels of floating-point accuracy through the use of integers. Cryptocurrencies such as Axe and Bitcoin are created through a cryptographically difficult process known as mining. Mining involves repeatedly solving hash algorithms until a valid solution for the current mining difficulty is discovered. Once discovered, the miner is permitted to create new units of the currency. This is known as the block reward. To ensure that the currency is not subject to endless inflation, the block reward is reduced at regular intervals, as shown in this calculation. Graphing this data results in a curve showing total coins in circulation, known as the coin emission rate. While Axe is based on Bitcoin, it significantly modifies the coin emission rate to offer a smoother reduction in coin emission over time. While Bitcoin reduces the coin emission rate by 50% every 4 years, Axe reduces the emission by one-fourteenth (approx. 7.14%) every 210240 blocks (approx. 383.25 days). It can be seen that reducing the block reward by a smaller amount each year offers a smoother transition to a fee-based economy than Bitcoin. Bitcoin’s total coin emission can be calculated as the sum of a geometric series, with the total emission approaching (but never reaching) 21,000,000 BTC. 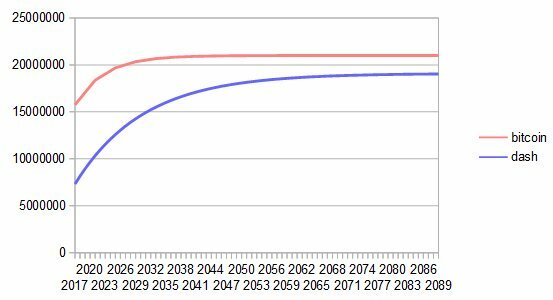 This will continue until 2140, but the mining reward reduces so quickly that 99% of all bitcoin will be in circulation by 2036, and 99.9% by 2048. This documentation is based on calculations and posts by moocowmoo. Please see this reddit post for more details, or run your own emission calculations using this tool. See this site for live data on current network statistics. Decentralized Governance by Blockchain, or DGBB, is Axe’s attempt to solve two important problems in cryptocurrency: governance and funding. 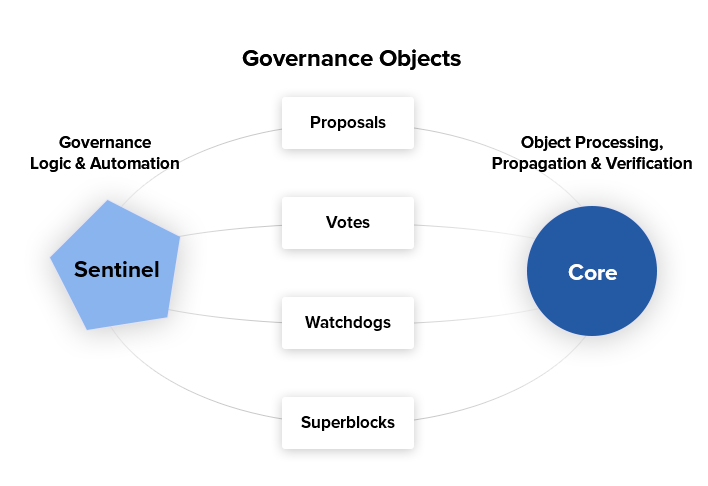 Governance in a decentralized project is difficult, because by definition there are no central authorities to make decisions for the project. In Axe, such decisions are made by the network, that is, by the owners of masternodes. The DGBB system allows each masternode to vote once (yes/no/abstain) for each proposal. If a proposal passes, it can then be implemented (or not) by Axe’s developers. A key example is early in 2016, when Axe’s Core Team submitted a proposal to the network asking whether the blocksize should be increased to 2 MB. Within 24 hours, consensus had been reached to approve this change. Compare this to Bitcoin, where debate on the blocksize has been raging for nearly three years. DGBB also provides a means for Axe to fund its own development. While other projects have to depend on donations or premined endowments, Axe uses 10% of the block reward to fund its own development. Every time a block is mined, 45% of the reward goes to the miner, 45% goes to a masternode, and the remaining 10% is not created until the end of the month. During the month, anybody can make a budget proposal to the network. If that proposal receives net approval of at least 10% of the masternode network, then at the end of the month a series of “superblocks” will be created. At that time, the block rewards that were not paid out (10% of each block) will be used to fund approved proposals. The network thus funds itself by reserving 10% of the block reward for budget projects. You can read more about Axe governance in the Governance section of this documentation. Sentinel is an autonomous agent for persisting, processing and automating Axe 12.1 governance objects and tasks, and for expanded functions in the upcoming Axe V13 release (Evolution). Sentinel is implemented as a Python application that binds to a local version 12.1 axed instance on each Axe 12.1 masternode. A Governance Object (or “govObject”) is a generic structure introduced in Axe Core 12.1 to allow for the creation of Budget Proposals, Triggers, and Watchdogs. Class inheritance has been utilized to extend this generic object into a “Proposal” object to supplant the current Axe budget system. Transactions on the Axe network are recorded in blocks on the blockchain. The size of each transaction is measured in bytes, but there is not necessarily a correlation between high value transactions and the number of bytes required to process the transaction. Instead, transaction size is affected by how many input and output addresses are involved, since more data must be written in the block to store this information. Each new block is generated by a miner, who is paid for completing the work to generate the block with a block reward. In order to prevent the network from being filled with spam transactions, the size of each block is artificially limited. As transaction volume increases, the space in each block becomes a scarce commodity. Because miners are not obliged to include any transaction in the blocks they produce, once blocks are full, a voluntary transaction fee can be included as an incentive to the miner to process the transaction. Most wallets include a small fee by default, although some miners will process transactions even if no fee is included. As an example, a standard and relatively simple transaction on the Axe network with one input, one output and a possible change address typically fits in the range of 200 - 400 bytes. Assuming a price of US$100 per AXE, the fee falls in the range of $0.0002 - $0.0004, or 1/50th of a cent. Processing a simple transaction using InstantSend at the same price is free of charge, while more complex InstantSend transactions may cost around 1-2 cents per transaction, depending on the number of inputs. These fees apply regardless of the Axe or dollar value of the transaction itself. PrivateSend works by creating denominations of 10, 1, 0.1, 0.01 and 0.001 AXE and then mixing these denominations with other users. Creation of the denominations is charged at the default fee for a standard transaction. Mixing is free, but to prevent spam attacks, an average of one in ten mixing transactions are charged a fee of 0.0001 AXE. Spending inputs mixed using PrivateSend incurs the usual standard or InstantSend fees, but to avoid creating a potentially identifiable change address, the fee is always rounded up to the lowest possible denomination. This is typically .001 AXE, so it is important to deduct the fee from the amount being sent if possible to minimise fees. Combining InstantSend and PrivateSend may be expensive due to this requirement and the fact that a PrivateSend transaction may require several inputs, while InstantSend charges a fee of 0.0001 AXE per input. Always check your fees before sending a transaction. Axe Evolution is the code name for a decentralized currency platform built on Axe blockchain technology. The goal is to provide simple access to the unique features and benefits of Axe to assist in the creation of decentralized technology. Axe introduces a tiered network design, which allows users to do various jobs for the network, along with decentralized API access and a decentralized file system. Axe Evolution will be released in stages. Axe Core releases 12.1 through to 12.4 will lay the groundwork for the decentralized features behind the scenes. An alpha version of Evolution is expected in the first half of 2018, including a basic implementation of AxeDrive, Primitives, DAPI and a simple T3 wallet. This will be released together with a series of Axe Improvement Proposals (DIPs), followed by a testnet phase with most basic functionality, and a first stable release in summer 2018. Social Wallet: We introduce a social wallet, which allows friends lists, grouping of users and shared multisig accounts. The following videos featuring Axe Founder Evan Duffield and Head of UI/UX Development Chuck Williams describe the development process and upcoming features of the Axe Evolution platform.